Contemporary Art Projects USA presents the Pre-Art Basel Miami Week Exhibition: “ART from Our Earth, the Sea and the Sky” curated by Mariavelia Savino at the ArtsPark@ Young Circle Gallery, located in One Young Circle, Hollywood, Florida. For the second time, Contemporary Art Projects USA exhibits at this important Gallery managed by the City of Hollywood. The significant selection of emerging or career visual artists, widely exhibited in the US and abroad, original and excellent in technique and artistic proposal, will mark a new standard for the facility. The goal of our curator Mariavelia Savino focuses on the uniqueness and quality of the artists that will display their point of view on subjects like nature, human beings, abstract and/or geometric art. 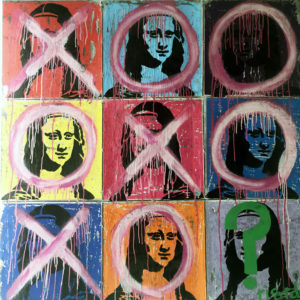 Special International Invited Artist, Ricardo Cardenas, will show a painting from his celebrated Series Tribute to the Great Masters made on his canvas of cement and iron bars using as background a Tic Tac Toe game to depict nine images of a Master Artist in a multicolored Warhol manner. As a guest artist, Luis Kaiulani, American sculptor, will present from his new series of work “Lines” on aluminum few pieces. He has been influenced by great international master artists as John Henry, Marc Di Suvero, Anthony Caro and Franz Weissman. As well, he will present at the Entrance of Exhibition during the Opening Reception, “The Big Red Clover”, part of Giants in the City Project: Monumental Inflatable Sculptures. Participants Artists: Ricardo Cardenas, Mexico, Invited Artist; Luis Kaiulani|USA, Guest Artist; BO MI JO, Korea; Betina Bradas, Argentina; Amalia Brujis, Peru; Julio Brujis, Peru; Sofia Chitikov, Russia; Cristian Coo | Chile; Kevin Cross, USA; Giano Currie, Suriname; Minakshi De, India; Chris Delias, Austria; Leo Di Tomaso, Italy-Venezuela; Kelly Fischer, USA-Switzerland; Melissa Hernandez, USA; Maria Isabel Lazo, Ecuador; Mai Yap, Panama-China; Celestino Ortiz, Puerto Rico; Tatiana Rajzman, Brazil; Lara Restelli, Argentina; Lifrancis Rojas, Venezuela; Nataly Schloser, Venezuela; Anica Shpilberg, Peru-USA; Virginia Subinaghi, Argentina; Adele Venter, Canada; Michele A. Utley-Voigt, USA; Amber Warren, USA.